Now a days due to large capacity hard drives (like 500GB), we tend to partition hard drive into more partitions for easy management of files and data. Each partition is assigned separate letter like C, D, E, F, G and so on. Do you want to modify this drive letter assignment of hard drive partition (or CD, DVD & USB drive) on your Windows computer? Ideally, this will involve complex registry change procedure. Using DriveLetterView portable utility you can change drive letter without any manual registry modifications. 1. 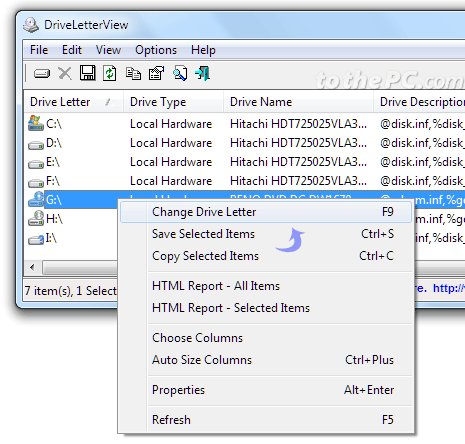 Download DriveLetterView utility from utility webpage. 2. Once zip file is downloaded, double click unzip and view contents. 3. Right click on DriveLetterView icon and then click ‘Run as administrator’ option. 4. Utility interface will open listing drive partitions on your Windows computer. It also show drive letter listing for CD, DVD and USB drives. 5. Right click on any drive partition and click Change Drive Letter option. 6. Then type new letter for specific partition in the pop-up box. Click OK to save changes for new drive partition letter name. You cannot attempt to assign drive letter that is already being used. Using this utility you can quickly rename drive partitions as per requirement and comfort of usage.